Gib Sea 51 is definitely one of the best boats which Dufour ever produced. Gib Sea 51 has 5 double cabins layout (and two cabins have convertible beds so they can have bunk beds as well). It is possible to reach skipper cabin trough front cabin, or from front window. Skipper cabin has bit smaller bed, but still big enough for 2 persons. Each cabin has own toilet. Gib Sea 51 can accommodate up to 12 persons (2 persons can sleep in saloon). Cockpit is very spacious, and well organised with space for glasses and place for storing things in table (with small compartment for cell phone during sailing). You will be impressed with good sailing performance of this yacht, especially during stronger winds! Cinderella has new main sail 2011 new genoa 2012. Engine is renewed in 2013. Upholstery is new from 2013/14 (including beds in rooms), bimmini and sprayhood are changed in 2014. Outboard engine 2,5 hp is free of charge in all periods. 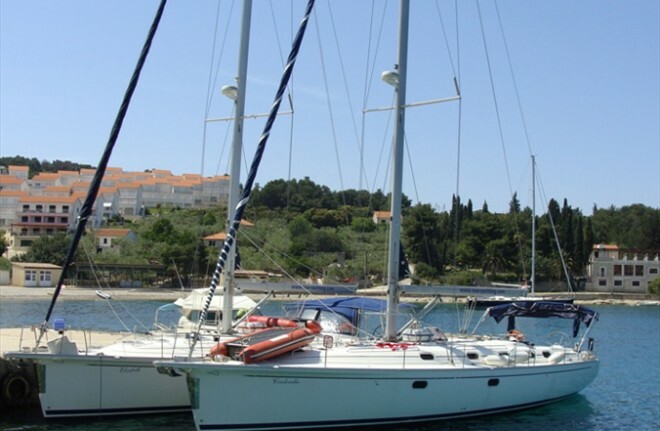 We have two identical boats available from our base Marina Kastela – Split- Croatia.